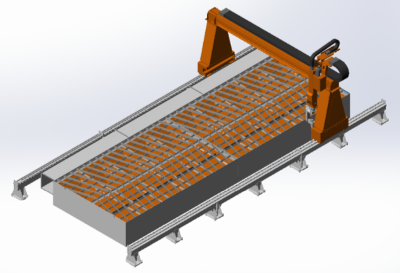 5-Axis, heavy-duty, double-side driven CNC gantry system for cutting complex shapes with beveling up to 45°. Precise positioning with rack and pinion on 3 axes and 2 rotational axes for torch rotation and inclination. Low backlash, precision gears, as well as highly rigid and precise rail guiding system enable the smooth motion, stable operation with inclined torch and excellent cut surface, also when beveling.